Pictured here with a John Deere Model H Series 47 Manure Spreader. 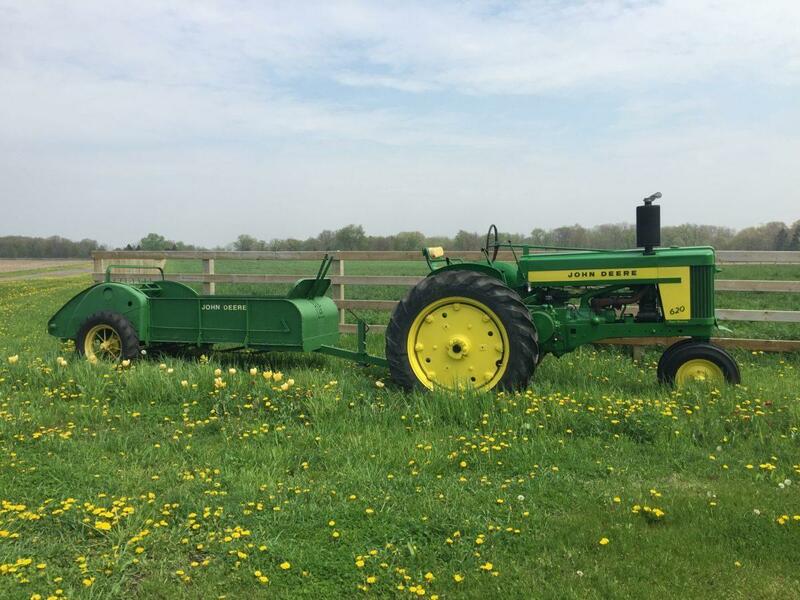 Produced from 1956 to 1958 this, Two-Cylinder 20 Series Row-Crop tractor was powered by the famous JD 2-cylinder 4-valve liquid-cooled engine delivering 53 HP. The 620 was the successor to the Model 60 and the biggest visible difference between them was the new, two-tone, green and yellow paint job, even though the design of the sheet metal is still the same as the Model 60. The new “Float-Ride” seat was introduced on these tractors. The engines were completely redesigned to provide more horsepower. It had a bore and stroke of 5 1/2 x 6 3/8 inches, 321 cid, 1125 rpm, 44.16 drawbar and 48.68 belt horsepower. Major changes were made to the Model 60 engine including: shorter stroke, aluminum pistons, larger rod and main bearings, a stronger crankshaft, redesigned cylinder head, and higher compression. Another addition which made the engines run a bit smoother was the distributor was now driven directly off the camshaft instead of previously being driven through the governor. This was also incorporated on the 520 and 720. The old Deere two cylinder tractors had fired on the compression and exhaust stroke. With the new camshaft driven distributor, they now only fired on the compression stroke which allowed longer point and spark plug life. The 620 was available in the “rowcrop” front wheel configurations, the “Standard”, and also as a “Hi-Crop”. The John Deere Model 620 tractor was a direct replacement for the 60, but it offered close to the same horsepower of the Model 70 at practically the same price. The 620 was advertised as a full 4 plow tractor with the power to handle heavy loads continuously at speeds that would cut days off a farmer’s work calendar. Even with its advanced features and beautiful bright paint job, plus improved operator convenience, a new Model 620 was only about 100 dollars more than what a new Model 70 had cost.